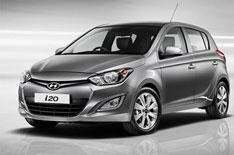 2012 Hyundai i20 prices revealed | What Car? The 2012 Hyundai i20 will cost from 9995 when it goes on sale next week. Changes to the Hyundai include a restyled front end, revised rear bumper and tail lights, upgraded interior plastics, and cleaner engines across the range. Three new trims are offered: Classic, Active and Style. Classic brings remote central locking, air-con, stability control and Vehicle Stability Management which links and optimises all the car's active safety systems as standard. Active trim available from 10,945 adds 15-inch alloys, Bluetooth connectivity with voice recognition, electric/heated door mirrors, and leather-trim for the steering wheel and gearknob. Style trim, which starts from 12,345, includes 16-inch alloys, automatic headlights and rain-sensitive wipers, as well as climate control and an automatic dimming rear-view mirror with integrated reversing camera. A convenience pack comes as a 525 option, and adds keyless entry, engine stop-start technology, chrome trim and a supervision instrument cluster. The Blue edition, which costs 11,795, comes with low-rolling-resistance tyres and Hyundais Stop and Go system. It's powered by a 1.1-litre diesel engine with average economy of 88.3mpg, and CO2 emissions of 84g/km. Two petrol engines are available a 1.2- and 1.4-litre which are now cleaner and more powerful than previous units. A 1.4-litre diesel engine is available from Active trim upwards. All versions of the 1.1-litre CRDi are exempt from road tax and Londons congestion charge as is the 1.4-litre CRDi Blue Drive edition.